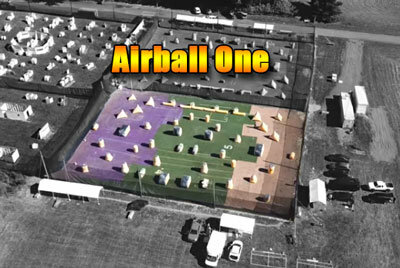 The DBS Airball Park has two fully turf, NXL style fields that can be used in many different ways to create an amazing airballer experience. Some weeks the fields will be combined for our 10-man events, others we will have the two field running for our MEGA SCRIMS that lead up to the NXL events, other weeks we will have one field up for games and the other field with bunkers setup for players to do drills. We suggest parking next to where you will be staging! You can back right up to the covered area you will use so you can pop your trunk and be ready to go. Once on site you will check in at our the Orange Registration Booth. To get there take your first left as you come down our driveway! Prior to checking in each player will be required to fill out a waiver, which can be done online prior to arrival or can be done on site. Click here to complete your waiver. The Staging Area is where you will spend your time between games. While here you will prepare your gear and yourself for the next game. Each field has an entry point. We use these entry points to organize games for players that are ready. Googles must go on prior to entering any entry point. Barrel socks must be on prior to exiting the fields. This field is our premiere field that is used by local teams like Seattle Thunder, Seattle Ninjas, and more to train for NXL events. This field is our backup so we can run drills on standard weekends OR have a second field for our MEGA SCRIMS. The Parking for the Airball Facility is at the beginning of our facility, so when the road turns left follow that and park! We have parking around both the fields, and the check-in is located between the two fields, so get parked then go check-in so you can start playing! Getting checked in for your adventure is easy as 1, 2, 3. All players are required to have a waiver before they can check in. You can do your waiver online prior to arrival, or you can do it on site. Head to an open window where you will turn in your waiver, then select your rental package, select any accessories you may want, then get your wrist band. After you are checked in you will go through a 5-7 minute Safety Briefing & Game Orientation that covers the equipment and game rules. After the Briefing you equipment will be issued. The Staging Area wraps both the fields, so pick a table under a covered area and get ready! We have a ton of tables and covered areas, so snag one by the field you will be on, or if you are a Walk-On player go to the Walk On Staging so we can get you in on Walk-On games! The Entry Points were built to help organize games! When you (or your team) are ready to play head over to the entry point. There is a divider in the middle. Teams go to the left, walk-on’s to the right. This line system allows us to quickly setup games.